Gastrointestinal (GI) bleeding in children is a common problem mainly attributed to peptic ulcers, erosive gastritis, and oesophageal varices. , Therapeutic endoscopy may produce haemostasis and prevent rebleeding. Different types of treatments are available such as injection therapy (epinephrine injection), electrocautery, heater probes, and mechanical therapy (such as clips). Although many methods, including drug therapy, sclerotherapy, and surgical procedures have been used to treat GI bleeding in recent years, they are not universally effective in reversing the condition in affected patients with bleeding peptic ulcers. The reason lies behind the fact that currently no effective medication can be used to stop bleeding from gastric and duodenal ulcers. Impaired haemostasis plays an important role in the pathogenesis of GI bleeding. ,,, On the other hand, in cases of severe GI bleeding, we need to clean the field and find time to locate the bleeding spot. Therefore, an effective pharmacological approach would be of certain value. Tranexamic acid (TXA) is a useful drug for the treatment of bleeding induced by both systemic and local fibrinolysis. TXA is an antifibrinolytic agent competitively inhibiting the activation of plasminogen to plasmin. This drug is routinely administered perorally or intravenously and about 80-90% is excreted in the urine via glomerular filtration. We hypothesize that using topical TXA via endoscopic procedures might be an effective approach for controlling GI haemorrhage induced by active bleeding ulcers. We aimed to evaluate the effect of topical TXA in achieving initial haemostasis and decreasing the rate of further bleeding compared with current therapeutic measures. In this randomised controlled trial, 120 children were evaluated by diagnostic procedures for GI bleeding, of which 63 (30 girls, 33 boys) aged 1-month to 15 years were recruited at the Children's Hospital in Tabriz, Northwest of Iran. [Figure 1] shows the CONSORT flow diagram for patient allocation. The protocol of the study was approved by local Ethics Committee and written informed consent was obtained from all parents. We included children <18 years of age with a diagnosis of bleeding gastric or duodenal ulcer on endoscopy. The exclusion criteria were contraindication for endoscopy, being hospitalised for another illness, coagulopathy, altered post-surgical anatomy of the stomach or duodenum, presence of intrahepatic portosystemic shunt, being treated by other endoscopic or surgical modalities within 14 days prior to the intended application of TXA, having hemodynamic instability and haemoglobin drop of more than 2 g/dl in 2 h.
The patients were randomly divided into two groups using computer-generated random numbers. In the case group, TXA was administered directly under endoscopic therapy for bleeding ulcers; 10 mL of serum saline with 5 mL (1 vial containing 500 mg) of TXA was directly applied to the surface of ulcer. In the control group, the same amount of serum saline with 1/10000 epinephrine was injected submucosally to the four quadrants of ulcer margins. In both groups, the patients received supportive medical therapy with intravenous fluids and Pantoprazole. Endoscopy was performed within 24 h after admission. Patients younger than 18 years with high risk ulcers (defined as active bleeding [Forrest IA, IB], non-bleeding visible vessel [NBVV, Forrest IIA] or adherent clots [Forrest IIB]) were enrolled. The patients with high risk peptic ulcer (Forrest IA-IIB) were managed endoscopically by injecting 10 mL of epinephrine (diluted 1:10000) around the ulcer crater to stop bleeding. The patients were monitored for supine and sitting vital signs (blood pressure [BP], pulse rate [PR]), intravenous fluid intake, blood transfusion, and urine output. Haemoglobin level was checked every 2 h for the initial 6 h of admission, then every 8 h. Blood transfusion was performed if haemoglobin was lower than 8 g/dl or the patient was in a shock state. The primary outcome was the evidence of clinically recurrent bleeding confirmed by repeated upper GI endoscopy or surgery within first 2 days after index endoscopy. The second endoscopy was performed for the patients who underwent endoscopic treatment. A repeated endoscopic evaluation was again scheduled for cases who presented with significant haemoglobin drop or clinically apparent GI bleeding (such as haemostasis or melena) within 8 weeks of the first endoscopic evaluation (the follow-up period). Upon endoscopy, proper haemostasis was defined if bleeding had stopped and if bleeding vessels were compressed. Clots covering ulcer hollows were elevated by means of irrigation through a "cheese-wiring" with a mini-snare during the first and second endoscopy. Clots overlying ulcers were lifted, and the base of the ulcer was examined. Endoscopic therapy was applied on bleeding arteries. Surgical intervention was indicated if the bleeding could not be controlled by endoscopic methods. Bleeding was considered as recurrent if any of the following parameters occurred: Reappearance of hematemesis or melena after stabilisation, unstable vital sign (BP ≤90, PR ≥120), a decrease in haemoglobin level of more than 2 g/dL and a decrease in the haematocrit level (>6% within 24 h after a transfusion), resulting in a haemoglobin level of 10 g/dL or less. Patients suspected to have rebleeding were evaluated by repeated endoscopy. Recurrent bleeding was confirmed if the ulcer was actively bleeding (spurting or oozing haemorrhage) or if there was fresh blood in the stomach and a clot covering the ulcer base. In such cases, endoscopic therapy with epinephrine injection and electrocoagulation was done to stop bleeding. Data were analysed using SPSS software, version 18 (SPSS Inc., Chicago, IL, USA). The results are expressed as percentage values of frequency or mean ± standard deviation (SD). The comparison of differences was performed using the Mann-Whitney U-test, Chi-square test, or Fisher's exact tests as appropriated. P < 0.05 was considered as statistically significant. The local ethics committee approved the study and informed consent was obtained from all parents. Iranian Registry of Clinical Trials (IRCT) registration code was IRCT201306105330N6. 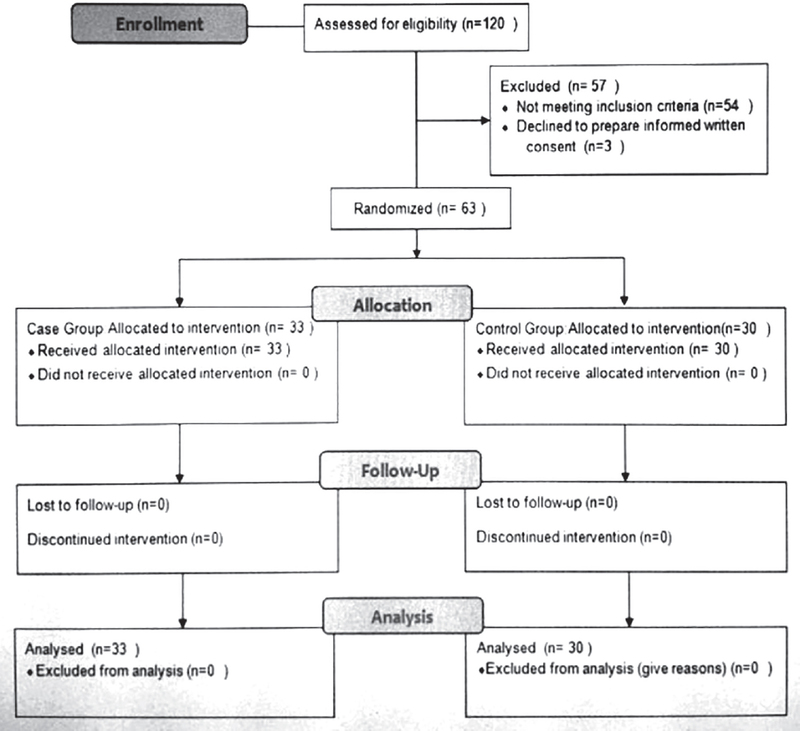 One hundred and twenty children were evaluated by diagnostic endoscopy due to GI bleeding. Endoscopic evidence of peptic ulcer disease was found in 66 (55%) children; ulcer in bulb in 20 (16.7%) patients and 30.33% of the patients had peptic ulcer disease. Post-bulbar duodenal erosion/ulcer was diagnosed in 7 (5.8 %) children. Thirty-nine (32.5%) patients had a gastric ulcer. The patients were allocated randomly to case (n = 33) and control (n = 30) groups. Three patients were excluded from the analysis because they did not provide written informed consent. Sixty-three patients with GI bleeding were enrolled in this study (30 girls and 33 boys) with a mean ± SD age of 5 ± 2.03 years (range: 1-month to 15 years). In one patient, bleeding developed during the 2 weeks after discharge during the follow-up. He was treated again with TXA injection, and bleeding did not reoccur up to 2 months of follow-up. In the control group, rebleeding occurred in 21 patients, two of them occurred during the hospital course and stopped with epinephrine injection and the patients recovered uneventfully. In two children bleeding did reoccur for up to 4 weeks. Surgical intervention was done in one patient because bleeding continued and endoscopic therapy failed. None of the patients died in both groups. Rebleeding occurred in 15 and 21 patients in the case and control groups, respectively (11.4% vs. 9.8%, P = 0.50). We found no significant difference between the two groups with respect to the number of blood transfusions and the duration of hospital stay (P = 0.06 and P = 0.07 respectively) [Table 1]. Based on the results obtained from this study, TXA (a potent inhibitor of the fibrinolytic system) could be used as a therapeutic drug to stop active GI bleeding. The mechanism underlying its haemostatic effect is the inhibition of plasminogen activation in body fluids and tissues. Thus, it inhibits fibrinolysis and stabilizes the clots by inhibiting the activation of plasminogen to active plasmin; thereby increasing the tendency of blood to coagulate. , The clinical rationale for the use of TXA is based on evidences that TXA could successfully control bleeding at different tissues, correct impaired haemostasis, and stop severe GI bleeding. In the present study, the discrepancy between the rate of recurrent bleeding was not statistically significant in two groups. The number of blood transfusions and the duration of hospital stay were lower in the case group, although it was not statistically significant. There was no death in both groups. The topical use of TXA has been tested in parotid surgery, open cardiac surgery, and haemophilia patients undergoing surgical procedures in the oral cavity. TXA is usually well tolerated, and side effects are uncommon. Nausea and diarrhoea are the most common adverse events when given perorally or intravenously. GI disturbances, dizziness, and hypotension, may occur after rapid intravenous infusion. Some studies revealed that prolonged treatment may increase the risk of a thrombotic complication, such as deep vein thrombosis. TXA in a low concentration (1 mg/mL) does not have any effect on platelet aggregation in vitro. ,,,, In this study, we used TXA as a topical drug and did not observe any complication. TXA decreases the activation of plasminogen to plasmin competitively, while it is also a non-competitive inhibitor of plasmin. Thus, the drug may have some advantages over epinephrine in clot stabilisation because of its pharmacologic characteristics. The role of topical TXA as an adjunctive treatment for upper GI bleeding is not well established. It is unclear whether this agent is capable of optimizing clot formation and stability in the GI tract. 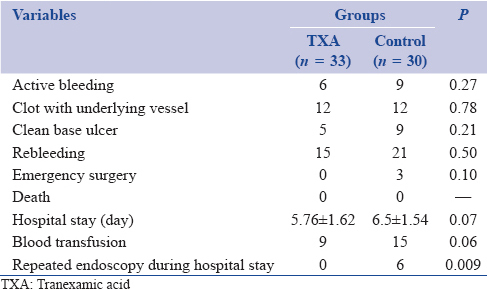 Given the good results we got in our sample patients, we hypothesised that using topical TXA via endoscopic procedures may be effective in cases of GI bleedings due to active bleeding ulcers. The limitation of this study was its small sample size. In order to establish this hypothesis and set a clinical guideline, a large number of clinical trials and multicentre studies are needed. Laine L. Rolling review: Upper gastrointestinal bleeding. Aliment Pharmacol Ther 1993;7:207-32. Rockall TA, Logan RF, Devlin HB, Northfield TC. Incidence of and mortality from acute upper gastrointestinal haemorrhage in the United Kingdom. Steering Committee and members of the National Audit of Acute Upper Gastrointestinal Haemorrhage. BMJ 1995;311:222-6. Stenberg B, Bylock A, Risberg B. Local fibrinolytic activity and its structural basis in experimental gastric ulcers. Eur J Clin Invest 1983;13:297-300. Henry DA, O'Connell DL. Effects of fibrinolytic inhibitors on mortality from upper gastrointestinal haemorrhage. BMJ 1989; 298:1142-6. Patchett SE, O'Donoghue DP. Pharmacological manipulation of gastric juice: Thrombelastographic assessment and implications for treatment of gastrointestinal haemorrhage. Gut 1995;36:358-62. Von Holstein CC, Eriksson SB, Källén R. Tranexamic acid as an aid to reducing blood transfusion requirements in gastric and duodenal bleeding. Br Med J (Clin Res Ed) 1987;294:7-10.
de Groot NL, van Oijen MG, Kessels K, Hemmink M, Weusten BL, Timmer R, et al. Reassessment of the predictive value of the Forrest classification for peptic ulcer rebleeding and mortality: Can classification be simplified? Endoscopy 2014;46:46-52. Sabovic M, Lavre J, Vujkovac B. Tranexamic acid is beneficial as adjunctive therapy in treating major upper gastrointestinal bleeding in dialysis patients. Nephrol Dial Transplant 2003;18:1388-91. Hawkey GM, Cole AT, McIntyre AS, Long RG, Hawkey CJ. Drug treatments in upper gastrointestinal bleeding: Value of endoscopic findings as surrogate end points. Gut 2001;49:372-9. Biggs JC, Hugh TB, Dodds AJ. Tranexamic acid and upper gastrointestinal haemorrhage - A double-blind trial. Gut 1976;17:729-34. McCormick PA, Ooi H, Crosbie O. Tranexamic acid for severe bleeding gastric antral vascular ectasia in cirrhosis. Gut 1998;42:750-2. Isacson S. Tranexamic acid in acute upper gastrointestinal bleeding. Scand J Gastroenterol Suppl 1987;137:64-6. Karski J, Djaiani G, Carroll J, Iwanochko M, Seneviratne P, Liu P, et al. Tranexamic acid and early saphenous vein graft patency in conventional coronary artery bypass graft surgery: A prospective randomized controlled clinical trial. J Thorac Cardiovasc Surg 2005;130:309-14. Mengistu AM, Röhm KD, Boldt J, Mayer J, Suttner SW, Piper SN. The influence of aprotinin and tranexamic acid on platelet function and postoperative blood loss in cardiac surgery. Anesth Analg 2008;107:391-7. Menichetti A, Tritapepe L, Ruvolo G, Speziale G, Cogliati A, Di Giovanni C, et al. Changes in coagulation patterns, blood loss and blood use after cardiopulmonary bypass: Aprotinin vs tranexamic acid vs epsilon aminocaproic acid. J Cardiovasc Surg (Torino) 1996;37:401-7. Hardy JF, Bélisle S, Dupont C, Harel F, Robitaille D, Roy M, et al. Prophylactic tranexamic acid and epsilon-aminocaproic acid for primary myocardial revascularization. Ann Thorac Surg 1998;65:371-6. Dietrich W, Spannagl M, Boehm J, Hauner K, Braun S, Schuster T, et al. Tranexamic acid and aprotinin in primary cardiac operations: An analysis of 220 cardiac surgical patients treated with tranexamic acid or aprotinin. Anesth Analg 2008;107:1469-78.